I was back at City Hall today to witness something many people thought would never happen. The Austin City Council voted 7-4 to approve the terms of a deal that would see a Major League Soccer stadium built at McKalla Place. It’s hard to overstate how momentous today was, not just in terms of soccer in Austin, but for the whole city. I’ve said from the beginning of this process that getting the City of Austin to agree to let a professional sports team use its land, at a below market value rate, was always going to be the biggest hurdle. There is a reason that there has never been a major league sports team in Austin, and the City Council has probably been the biggest obstacle to that. Even 5 years ago, most soccer fans in Austin never believed this was possible. But now it is going to happen. And it’s happened remarkably quickly. I still can’t quite believe it. A last-ditch attempt to remove the words “and execution” from the above proposal failed. Several council members wanted another opportunity to review and vote down the final version of the lease. That attempt was defeated. Importantly that means that the final lease between the City and PSV won’t need to come back in front of the city council. That means no more 4am meetings. That means no more last-minute amendments. No more consultations. That means no one else is going to be able to bid to use this land. There were still a few tense moments today as further amendments were made to the term sheet. Apparently, negotiations were still going on late into the evening last night. One particular amendment, regarding adding a performance bond or bonds to the lease, passed to the apparent surprise of the Mayor, and may still need to be ironed out. But when the final vote came down 7-4 at around 2pm today, the mood quickly turned celebratory at a packed City Hall. 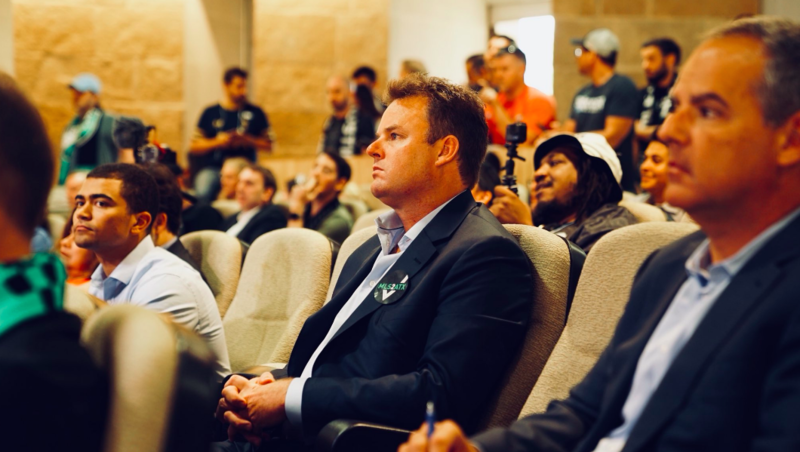 Several council members made the point that they have been persuaded during this process by the passion and tenacity of the soccer supporters. Council Members Delia Garza and Jimmy Flanagan both mentioned that they have received more questions and correspondence from their constituents about soccer than about any other issue. In a City with as many activists as Austin, that is really saying something. Apparently, PSV can now finalize the process of financing the construction of the stadium with JP Morgan. I would also expect announcements in the near future about the name of the team, the logo and the colors. Of course, there is still a lawsuit pending in Ohio, as the City of Columbus attempts to stall or prevent the move to Austin. The most recent developments on that case are that the Franklin County Judge ordered an extension of the tolling period, (where he stopped the clock on the 6 month notice period), until September 19, to take into account the time lost during the recent appeal. The Judge has also scheduled a hearing on PSV’s motion to dismiss the case for Friday September 7th at 2pm. I’ve written previously about how I don’t think the motion to dismiss will be granted, but my sense is that there might some sort of resolution even before the hearing, in the form of a settlement. The Austin City Council didn’t seem to be worried about the Ohio lawsuit, and last week PSV representative Richard Suttle even said that this vote would likely provide the impetus for the Ohio lawsuit to be resolved. And I very much doubt JP Morgan would approve financing of a $200 million stadium without a guarantee that there will be a team to play in it. But what would a settlement look like? Well putting on my mediator’s hat for a moment, I do think there is a way out of this for both sides. There is a clear desire on the part of PSV and MLS to be in Austin. And now, Austin has shown that it wants PSV and MLS here. There is also a clear desire on the part of Columbus fans to keep the Crew in Columbus. But they don’t want anything to do with Mr. Precourt. MLS now has the tools to hammer out a settlement. As I wrote back in January, unlike other sports leagues, soccer franchises have no independent right to play in Major League Soccer. The league, via its Board of Governors, determines who gets to play, and who doesn’t get to play. And Ohio knows that the league could simply revoke the right of PSV to play in Columbus, and then designate a new team in Austin to be operated by PSV, or perhaps an “affiliate” of PSV. That may be the nuclear option, but now that Austin are on board with MLS and PSV, that threat becomes a very real possibility. I would think that if MLS offers the City of Columbus a deal whereby the intellectual property and the history of the Crew remains in Columbus, and Columbus is given a David Beckham-like option to operate a new franchise, assuming certain conditions are met, then Columbus would and should take that deal. 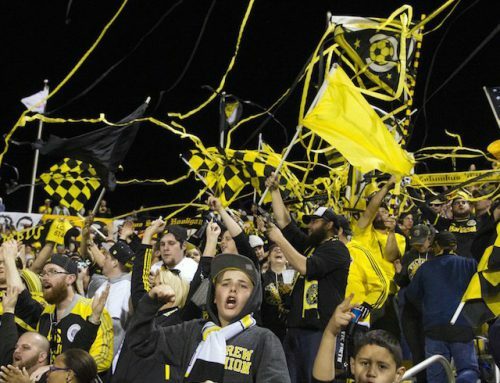 Maybe the Columbus Crew have to rebuild in USL Pro with a new team and new ownership for a year or two, but with that sort of settlement, Austin gets a team immediately, and the Crew would be #saved. Both sides can declare victory and MLS avoids a difficult litigation. I do hope there is a MLS team in Columbus in the future. Can you imagine what the Austin v Columbus rivalry would be like? Whatever happens, I wouldn’t worry about the Ohio lawsuit right now. Today is a day for soccer fans in Austin to finally acccept that there will be a major league team here in Austin in the very near future. That team may be here as early as March 2019 at a temporary venue. No word on what that venue might be yet, but last month I went to see a friendly between Tigres and Pachuca at Dell Diamond, and it worked pretty well. So add Dell Diamond in Round Rock to the list of possible temporary homes for the new Austin MLS team.